Hooray for Thanksgiving! The best day of the year to eat. And sometimes after Thanksgiving we still eat, and eat, and eat… By about day 4 or 5 of Thanksgiving leftovers, we are ready for something new. Here are some fun ideas to creatively use up those Thanksgiving leftovers. 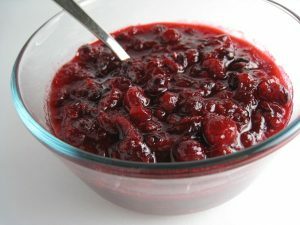 Cranberry Sauce – Cranberry sauce is one of my favorite Thanksgiving leftovers. I love to spread cranberry sauce on deli meat sandwiches; especially with a little cream cheese. You can also add cranberry sauce to yogurt, oatmeal, smoothies, or even as a topping for vanilla ice cream. A little cranberry sauce added to homemade whipped cream can make a fun, festive topping for hot cocoa, cider, pie, etc. 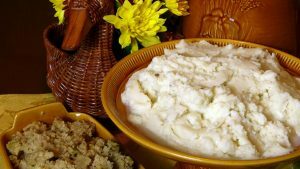 Mashed Potatoes – Shepherd’s Pie, anyone? That is the first thing I get excited to make with leftover mashed potatoes. Mashed potatoes make a yummy topping on meatloaf as well as other casseroles. There are many bread, roll, doughnut, and other pastry recipes that use mashed potatoes. In my Internet searching, I came across several recipes for potato dumplings that looked intriguing and yummy. Sweet Potatoes – Like mashed potatoes, sweet potatoes can be added to many bread and pastry recipes. You can make sweet potato pancakes by mixing an egg or two with some leftover, mashed sweet potatoes and then frying them on the gridle. Sweet potatoes can be added to thicken chilis or stews. Sweet potatoes can also be used in burritos, quesadillas, and other Mexican-inspired dishes. Stuffing – Stuffing is, in my opinion, the most difficult leftover to work with. But believe it or not, there are some great recipes and ideas for using up stuffing too. Apparently, stuffing can be used to stuff more than just birds. You can make stuffing-stuffed peppers, mushrooms, and meatballs. Stuffing can be turned into breakfast foods like breakfast hash and stuffing baked eggs. Stuffing also can be delicious on top of some casseroles and dishes like chicken cordon bleu. I am now looking forward to using my Thanksgiving leftovers this year! How about you? What else do you do with Thanksgiving leftovers? Have a very happy Thanksgiving! Mix turkey leftovers with barbeque sauce in a pan on the stove. Heat over medium heat until the turkey is warmed through. While turkey is heating, turn on the oven broiler to high. Place the hoagie sandwich rolls, open-faced, on a baking sheet. Put a slice of cheese on each roll. Put the rolls in the broiler for 2-3 minutes until toasted… (Make sure you check the rolls regularly to prevent them from burning). Put some of the barbequed turkey mixture on each roll. Top with a slice of turkey bacon, avocado and red onion slices. Eat and enjoy! Mix lettuce and greens together and divide among four plates. Top each pile with turkey strips, kiwi, mushrooms, and tomatoes. In a blender container or food processor bowl, combine ingredients for vinaigrette. Cover and blend or process until smooth. Drizzle vinaigrette over salad and pass around a fresh pepper grinder for a garnish. 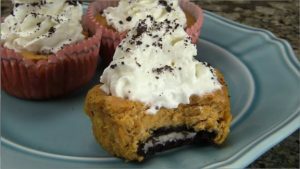 Put one Oreo into each cupcake slot in a lined cupcake pan. Mix remaining ingredients together with an electric mixer. Pour over crust. Bake 35-40 minutes at 350°. Cool completely at room temperature, then refrigerate overnight. Cut a hole in the top of the pumpkin and clean it out. Put rice and water in a microwave safe dish and cook on high until rice is tender (or use a rice cooker). Brown ground beef in a large frying pan and add onions to saute. When ground beef is no longer pink, add the rest of the ingredients and stir until completely mixed. 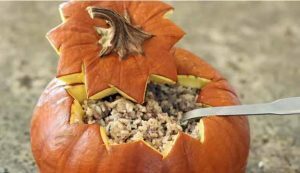 Mix ground beef mixture and rice together and pour into pumpkin. Put the top back on the pumpkin and bake at 350° for 1 hour. Be sure to scoop out part of pumpkin when serving. 1. Fill a stock pot half to three quarters full of water and boil it. 2. Add bouillon cubes and the turkey carcass and let it boil for about 45 minutes to an hour. 3. While the carcass is boiling, chop up the rest of the vegetables. 4. Use a slotted spoon to remove the turkey bones from the boiling water. 5. Add all the vegetables and while they’re cooking, remove the meat from the turkey carcass. 6. Chop the turkey meat into bite sized chunks and add to stock pot. 7. When vegetables are nearly ready, add the elbow macaroni. 8. Season well with salt and pepper (it takes a lot of salt!). Note: Add more water as needed until the consistency is the way you prefer it. Mix and add up to 5 pounds cubed turkey breast–marinate overnight and grill. 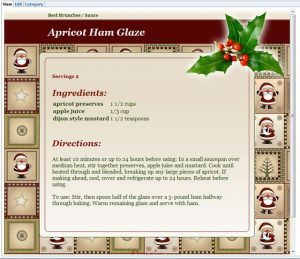 Piles of recipe cards in your drawer? 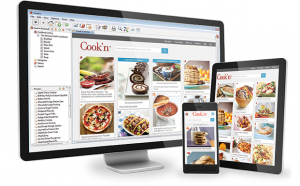 ~~~ Download Cook’n today and get organized! My heart is heavy this morning with all the anger and hatred going on (not only in Ferguson) but in other areas of the country. I’m not going to comment either way on my thoughts on the decision that was made on the death of Michael Brown. The most important thing is what’s going on in reaction to it. I’ve never seen anything like this! I was glued to my TV the night before last from 5pm until about 2:30 yesterday morning. My heart goes out to the Brown family. What a painful loss. I could not even begin to imagine if that were my son! I watched in enormous disbelief, and all the while asking myself, “What is this cruel world coming to?” I know to an (end) in an hour that we do not suspect. (Rapture) I truly believe that; as my mother taught me this, and the Bible tells us so. 43″ But be sure of this, that if the head of the house had known at what time of the night the thief was coming, he would have been on the alert and would not have allowed his house to be broken into. 44″For this reason you also must be ready; for the Son of Man is coming at an hour when you do not think He will. What was I witnessing as I sat there in horror? 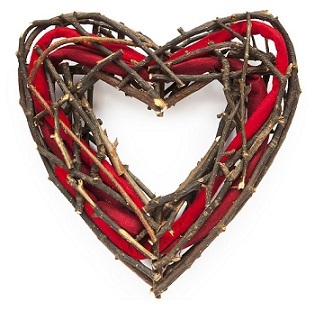 Violence, hatred, and anger…towards who and what?! We ARE living in the last days, specifically how many, we do not know. O God, grant me a heart full of tender mercy. Dear Lord, keep my thoughts fixed on what is true, pure, excellent and worthy of praise. Dear Lord, help me to stay focused on Your word rather than what my human eyes can see. Dear Lord, may we never retaliate when we feel wronged, but help us to make choices that would show that we love. Good Jesus, give me a deep love for Thee, that nothing may be too hard for me to bear from Thee. In addition, lets keep praying for all the police officers that are putting their lives at stake and while they are doing their job to the best of their abilities. 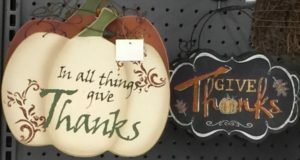 Normally, I’m the first one to be in the Thanksgiving spirit, but as I pushed my cart through the grocery store I wished we could skip it this year. I passed the turkey, stuffing and pumpkin pie without a glance. Mom wouldn’t be with us, and neither would anyone else. What kind of Thanksgiving was that? and give thanks to his holy name! Now, our God, we give you thanks, and praise your glorious name. 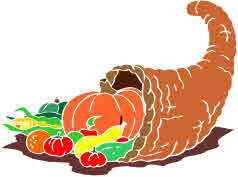 It is my wish that every one of you to have a joyous and safe, Happy Thanksgiving! Spend it with your family and be thankful for them and most importanty, love them! !